BOSTON, January 31, 2012 – The number of c ompleted foreclosures in Massachusetts dropped by more than 30 percent in 2011 to 8,528, down from 12,238 in 2010, according to the latest report from The Warren Group, publisher of Banker & Tradesman. The number of foreclosure petitions declined more drastically, dropping by more than 47 percent to 12,634 last year from 23,931 in 2010. Foreclosure petitions – the first step in the foreclosure process in Massachusetts – increased significantly in December. A total of 1,009 starts were recorded, a near 38 percent jump from 733 in December 2010. 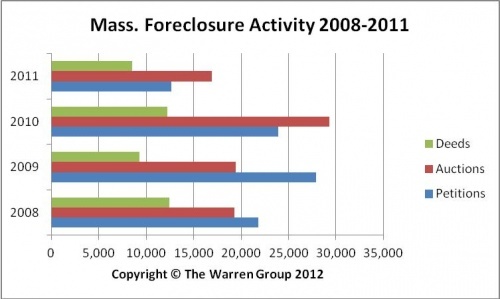 The number of foreclosure petitions exceeded 1,000 for eight months in 2011. In 2010, the level surpassed 2,000 in all but four months. In December, there were 757 foreclosure deeds, a 56 percent increase from 485 deeds recorded in December 2010. Foreclosure deeds represent completed foreclosures. Foreclosure deeds reached its highest point in August, posting 947 completed foreclosures. Both foreclosure petitions and deeds rose in the fourth quarter. A total of 3,217 foreclosure petitions were recorded in the fourth quarter of 2011, up 8 percent from the 2,969 petitions during the same period in 2010. This is the first time quarterly petitions rose since fourth quarter 2009. Foreclosure deeds increased to 2,263 in the fourth quarter, a 55 percent jump from 1,456 deeds in the fourth quarter of 2010. In 2011, 3.8 percent of single-family home sales statewide were bank-owned properties, down from 6.5 percent in 2010. Bank-owned property sales of condominiums accounted for 3.5 percent of all condo sales statewide in 2011. That’s down from 2010, when bank-owned condo sales represented 5.6 percent of all condo sales. The Warren Group also tracked a large decrease in auction announcements in 2011. A total of 16,941 auction announcements were tracked in 2011, a 42 percent drop from 29,277 in 2010. Auction announcements in December totaled 1,135, a 5.5 percent increase from 1,076 during the same month in 2010.